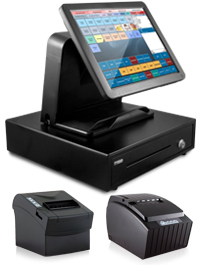 These are complete Restaurant POS Systems with New BPAPOS Elite All-In-One Computers. These new innovative computers come with a 2 year warranty. *Multiple stations are priced with a single Kitchen Printer and Cash Drawer. These Systems are also available with a back office computer, Please call for pricing. Our Business Plus Accounting software is included free on each Point of Sale terminal you purchase from us. Rather than making an expensive software purchase up front, you pay nothing up front and a very reasonable fee of $40 per month for support, upgrades, and software licensing. RapidServer tablet licenses are an additional $15/month each. You receive unlimited telephone support during our regular business hours and free updates to the software as soon as they are released. These systems are available with either our Business Plus Accounting Restaurant Professional or our Business Plus Accounting Restaurant Delivery software. 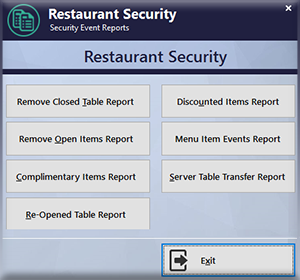 BPA Restaurant Professional provides a complete software package ideal for most restaurants including fine-dining and sit-down establishments. BPA Restaurant Delivery includes additional functionality for pizza or delivery businesses, and is optimized for cashier based checkout. Both packages offer a complete Restaurant Point of Sale System built on top of a complete business accounting system. This means in addition to running your restaurant floor, BPA Restaurant software can help you track your inventory, your accounts receivable, your accounts payable, it can help you write checks and balance your bank account. It can run your payroll, track maintenance on your equipment, and provide all of your general ledger and accounting reports. It also provides over 260 business reports covering all areas of your business! Not only do you receive the Restaurant Point of Sale Software but you also receive Point of Sale Modules to run gift stores, delis, and catering. See description of software features below. 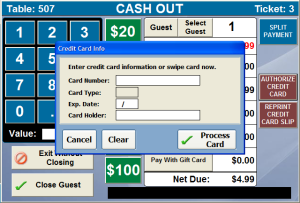 Gift Card Processing: Our software includes built in gift card processing. 19% of all gift cards are never redeemed. This amounts to $2,000 - $10,000 per year for most restaurants. Other restaurant software products require you to use a Gift Card Service Provider; these providers keep the unredeemed money and you loose the profit. With our product, there is no gift card service provider and you keep all profit from the sale of a gift card. Most Complete Product Available: This is by far the most complete restaurant software product on the market today. It integrates with Business Plus Accounting for all your accounting and payroll needs. It also integrates with our BPA Hotel & Property Management software if your restaurant is part of a hotel operation. Fully Integrated Accounting: This software comes completely integrated with a full accounting software package: "Business Plus Accounting." This saves you the expense of purchasing another accounting package and paying for support and upgrades for that package. It also eliminates the many problems associated with transferring data between packages. If you choose not to use the accounting software, it has no effect on the Restaurant Software. Quality Support: We provide excellent support via telephone, e-mail, and remote desktop access (using the internet, you can have our support technicians log in directly to your PC to provide support and assistance with our software and show you what to do). Getting support directly from the creators of the software means top quality support from people who really know the product. Support is available 24 hours a day without having to hope someone reads and answers your e-mail. Purchase our products with confidence. We are a software engineering company that has been in business for over 20 years and has over 12,000 business software installations. When you call for support you will talk to qualified technicians and professional engineers. Other sellers are often simply reselling software from other manufacturers. Buying from Business Software Solutions, you are buying software direct from the manufacturer. This gives you a direct line of software support from the creators of the software, and decreases the price you pay for your software. Simple Navigation. Functions like splitting tickets, removing items, quick-payment, print ticket, print cook's tickets, and many others are available right from the main POS screen. Include up to 14 menus which can be accessed without scrolling through categories. Over 14,000 items can be included in the menu. Each menu has a unique color to make it easier to know where you are. Items on a menu can be grouped and colored together. Quick & Easy. One button Quick Sale and One button Quick Cash out functions. Automatically duplicate an item with a single button. Flexible. Each item can have multiple sides and modifier lists assigned. Modifiers can include pricing. Cooking instructions and other notes can be added. Custom notes can be entered using an on-screen keyboard. Once an item has been entered, you can edit the item and the assigned modifiers. Customers can be identified. Customer notes can be entered. Customer pictures can be entered and customers can have a variety of special pricing. Keep your servers on the floor where they can sell more items to your customers. Get food to your customers and turn tables more quickly with instantaneous communication from the servers to the cooks. Accomplish these goals with BPA RapidServer Android Tablets which are fully integrated with Business Plus Accounting Restaurant Professional. Your servers can work more efficiently allowing your cooks to better handle orders which will decrease the time it takes to serve your customers. One of the main goals of a restaurant is to be able to serve more people, efficiently, while lowering costs. 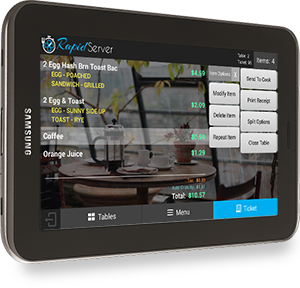 BPA RapidServer Android Restaurant Tablets give you the edge you need to achieve this goal. Employees can clock in and out and can log in and out of the POS screen using the touch screen or using employee cards. Managers can use the touch screen or their manager password card to authorize restricted functions like Voiding Tickets or Comping items. You can restrict actions that might allow employees to steal from you, such as removing items after a cook's ticket has been printed. The software includes a security events module that will interface with your video security cameras. You can print reports and then view the events on your security videos. Security reports show items that have been removed, tickets that have been voided, items that have been comp'ed, discounted items, coupons used and other user definable security events. Print reports showing items that have been removed, tickets that have been voided, and items that have been comp'ed or discounted. The password system allows you to specify which software modules and functions each employee has access to and creates a log entry each time a password is entered so you can track what your employees are doing. Specify which software modules and functions each employee has access to. One restaurant owner reported firing his whole staff after upgrading to BPA Restaurant Professional and finally being able to see how dishonest his employees were! BPA Restaurant Professional is built on our Business Plus Accounting software package, and includes a complete set of business and accounting tools fully integrated with the restaurant point of sale. Includes all of the functions of a complete Accounting System, including Accounts Payable, Accounts Receivable, Traditional Customer Ordering and Point of Sale, Vendor Ordering and Inventory, Hundreds of Reports, and many other features. Includes a payroll module which is integrated with the employee time clock. Includes an equipment maintenance and tracking module for tracking your restaurant's equipment. Many more accounting and business functions! BPA Restaurant Professional includes X-Charge from OpenEdge for Integrated Credit Card Processing. We have partnered with them to provide integrated credit and debit card processing solutions. More Secure Transactions. Business Plus Accounting is a PCI Compliant Product, as are our preferred partner, OpenEdge. PCI compliance helps protect you and your customers from credit card theft and helps you stay compliant with industry requirements. Fast Transactions. Most credit card authorizations will be returned in 5 seconds or less. Simplicity with Accuracy. With integrated credit card processing, your servers will see a smooth flow from the beginning to end of transaction. There is no re-keying of the sales amount which virtually eliminates the chance for error. ONE RECEIPT For Your Customers. You will not have to issue a Business Plus Accounting software receipt AND a separate credit card receipt. X-Charge is a software product provided by OpenEdge. To use these integrated solutions you will need to sign up with a Merchant Account. If you have a current merchant account provider or are unable to run with our preferred partner, we also support integrated credit card processing through PAYware Point from VeriFone, for an additional fee. These few features are just the beginning of what BPA Restaurant Professional can do. Please see the feature list below for more details! This Product was recently shown at the "Western Food Service and Hospitality Expo" in Los Angeles. Visitors at the show described this product as the best value at the show for a variety of reasons. Most commonly mentioned were Price, Reporting (260+ reports), Inventory Tools, complete integrated Accounting system, Payroll, and affordable Hardware Systems. 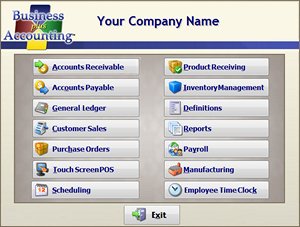 BPA Restaurant Professional is integrated with our business system, "Business Plus Accounting". Business Plus Accounting was rated by Computer Credible Magazine as being: "By Far The Easiest To Install and Use Of Any Package We Have Ever Reviewed!" If you have out grown QuickBooks this software will work for you. Business Plus Accounting Restaurant Professional software is included at no charge with each hardware station you purchase. "BPA Restaurant Professional" goes well beyond competing restaurant systems like Aloha, Micros etc.. This is by far the most comprehensive restaurant product on the market today. And knowing the expense and the risk new restaurant owners face we are offering you this great software product for a support, upgrade and licensing fee of $40.00/month. You pay nothing for the software product and only $40.00 per month for support, upgrade & licensing. For your licensing fees you receive UNLIMITED FREE SOFTWARE SUPPORT Monday-Friday 8:30am-5:00pm and FREE UPGRADES. This is a great value and there is no contract to sign. If you stop running our software you are under no obligation. Multi User - When you purchase your hardware POS stations from us the software terminal license is always free. When you purchase your own hardware you are required to pay a software terminal license fee for each additional POS station. Copyright 2003-2019 Business Software Solutions, Inc.